Best Electric Skateboard 2018 Update - Eat. Move. Hack. There are several amazing electric skateboards available for purchase in 2018. With prices ranging from $200 to $1200+, does more expensive necessarily mean better? In this article, we will take a look at the best electric skateboard that works perfectly with your budget and interests! Electric skateboards are simple street boards or longboards that have been fitted with a battery, motors, and a remote control for automatic movement of the skateboard. They can be bought fully assembled or built by the owner. It gives riders the ability to travel at speeds that can reach 40 miles per hour or higher, depending on the model and terrain that the board is being operated on. Riders can move easily up hills and even apply brakes when speed should be reduced. The batteries are rechargeable and typically rely on lithium ion. This makes electric skateboards a great option for beginners who are just learning how to skate or anyone looking for a speedy thrill. Here is a breakdown of the different performance options for an electric skateboard. These are generally measured on each board and can be an easy way to compare electric skateboards. Range – This is a measurement for how long an electric board can travel without having to charge its batteries. Some boards come with extra batteries which can extend your travel range. Boards can go between 4 and 40 miles in a single charge. Battery – This is a measurement for how long an electric board can travel without having to charge its batteries. Some boards come with extra batteries which can extend your travel range. Boards can go between 4 and 40 miles in a single charge. Motor – There are two main motor types for an electric skateboard – in-wheel hubs and belt drives. In-wheel hubs are slower, less powerful, less responsive, and a lot cheaper. Belt drives are much faster, but more expensive. You’ll also have to deal with the occasional belt ripping, which you can fix yourself using a replacement belt. One of the most important aspects of purchasing an electric skateboard, should probably be the board itself (duh!). Electric skateboards come in several different shapes and sizes and are made of different materials. They can also weigh anywhere from 4 to 24 lbs which is something to consider because you may have to carry the board at certain points in time. Board Size and Shape – The most common electric skateboard shapes are the pintail and mini-cruisers. This should be considered when thinking about what type of terrain you will be mostly riding on. Weight – The weight of a board might not seem like something to consider, but it is. At some points in time you will have to carry the board around – although this isn’t the major factor. The main reason to pay attention to the weight of the board is because heavier boards are better for off-roading on difficult terrain, while lighter boards are better for cruising on cement. Board Material – Boards are mostly made from three different types of materials – maple, bamboo, and carbon fiber. The wooden versions are generally cheaper while carbon fiber is more expensive, but can provide a smoother ride. Price is a driving factor for most people when purchasing pretty much anything. It can be even a bigger factor when the purchase you are making can cost upwards of $1500+. Before reading through our guide below about finding the best electric skateboard, it is important that you set a budget for your purchase. You do not want to spend extra money on features that you probably won’t end up using. To help you decide which skateboard to choose, we have broken down the categories into Best Electric Skateboard Overall, Best by Value, Best Under $1000, Best Under $500, Best of the Rest. Electric skateboards can cost anywhere from $180 to $3650 so you should set your budget early! These are just a few options that we couldn’t fit into the previous three categories. Terrain – What type of terrain are you planning to be riding on? Sidewalk, paved roads, dirt, rocks, etc. And what is the elevation of that surface – an incline or mostly flat? Weight Support – If you are a heavier person, this is probably something you might want to look at when selecting an electric skateboard. Most boards note the maximum weight you should be to ride. Warranty – We try to focus on the most well-known and reputable companies. Electric skateboards are still a newer device and products are coming out all the time. It is important to see what warranty is offered in case your skateboard does happen to break. Special Features – Including, but not limited to integrated headlights, waterproof, air travel compatible, fire retardant, tank treads, hidden battery, hidden motors, changeable deck, changeable trucks, battery doubles as USB power pack, and self-balancing. Customer Service – As mentioned above, we are focusing on the most reputable companies so customer service shouldn’t be of too much concern. But, if you decide to purchase an electric skateboard from a company not suggested below, it is wise to look into any complaints online and the company’s responses. The best electric skateboard overall is Boosted’s 2nd Gen Dual+ Extended Range Electric Skateboard. Of course this will be the most highly debated category, but we think our pick is a good one. Coming in at under $1500, will set you back a bit, but if you are serious about electric skateboarding, it will be worth it. If you aren’t too serious about electric skateboarding and want to spend a little less money, you should probably check out the category below – Best Value. If you are already familiar with the electric skateboarding community then you already know the name Boosted. Boosted electric skateboards is known for their quality, long lifespans, and great customer support. 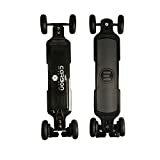 Ride: Boosted 2nd Gen Dual+ uses a belt-drive motor which provides one of the smoothest rides out of any electric skateboard as noted by both Wirecutter and Digital Trends. Unlike other boards that are a bit jerky or too sudden when accelerating or decelerating, the Boost 2nd Gen Dual+ provides a smooth acceleration from a stand still. It also doesn’t require a super delicate touch on the decelerator to come to a stop. Speed + Power: The motor provides 2000 watts of power which is enough for a top speed of 22mph. If you have never ridden an electric skateboard, you are in for a treat at these speeds. There is also enough power to climb hills with a 25 percent grade. Those numbers listed are the top end and dependent on the weight of the rider and how much battery is left. Extras: USB port available on board to install headlights, tail lights, or charge smartphones. The board features water resistant parts so you don’t have to avoid small puddles when cruising. Interchangeable parts make modifications and additional installation a simple task. Note: The board has 4 different modes – Eco, Beginner, Expert, and Pro. So if the board doesn’t seem speedy enough for you, try changing to a higher setting. Range: On the original Boosted Dual+ 2nd Gen, the max range is only 7 miles. This is usually enough for most riders, but pales in comparison to other boards that are much cheaper. However, you are able to purchase an extended battery which increases the range to a total of 12 miles. Regenerative Braking: Although this feature can extend the range of the board, it is not without consequences. Essentially the battery recharges itself using the energy it creates while breaking. However, if you are going down a steep hill and break hard, the battery will start to overcharge and the board will shut down to prevent overheating. You can avoid this issue by slowly going down steep hills and going easy on the break. The Boosted 2nd Gen Dual+ is our #1 best electric skateboard for a reason. It contains all of the features you will need without going overboard with the price. Yes, it is an expensive board, but that is the price it costs to has the smoothest ride with enough power to get you to those top speeds. Now with extended range, get around with incredible speed and ease on the most powerful electric skateboard. Extended Range Battery - 12 to 14 miles. Light enough to carry anywhere - powerful enough to go everywhere. 25% grade hill climbing - 22 mph top speed - regenerative breaking. 2,000 watts of power. Extra traction grip tape. Our choice for the best electric skateboard for value is the Acton Blink S. It doesn’t have all the features and power of our overall choice for best electric skateboard, but in comes in for about one-third of the price. Wirecutter calls it their favorite electric skateboard due to having all the features that you probably need and a great price. The perfect combination of power, performance, and price. 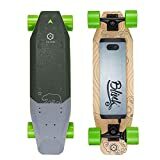 The Acton Blink S is on the smaller side, but it is perfect for cruising around the neighborhood or a campus. It provides a smooth ride and with a 600 watt motor, it packs quite the punch. With a max speed of 15mph and the ability to climb hills with a 15 percent grade, the Acton Blink S provides an excellent ride for a fraction of the price of some other boards. The board features three different ride modes so it is usable for beginners and experts alike. Built in LED lights make riders visible at night, which makes this board really safe. Weighing in at only 11 lbs, the Blink S is compact and easy to carry around wherever you may need to go. Accelerating and Decelerating: Compared to the Boosted board listed above, the Acton Blink S is definitely not as smooth. You will have to get used to the controls to be able to have a smooth acceleration or deceleration. Overall, the ACTON BLINK S is going to be the best bang for your buck. It provides a smooth ride and all the features you need at a fraction of the cost of other boards. If you are looking to get started with electric skateboarding without breaking the bank, this is the best electric skateboard for you! RIDE UP TO 7 MILES ON A SINGLE CHARGE. Unlike our competitors, our lithium-ion batteries won't wear out after just a few minutes of fun! Our riders can enjoy several hours of cruising on every charge. BUILT-IN SAFETY LIGHTS. Our built-in LED lights make our riders highly visible to traffic, pedestrians, and even at night! Safety is our top priority, and the Acton Blink S has got you covered! PORTABLE AND LIGHT. Weighing in at only 11 pounds, our lightweight electric skateboards are easy to pack up and carry around at school, work, and home. Perfect for the busy student! Recommended user weight: 180 lbs. Here are a few of the other tops boards on the market, but didn’t quite make the cut for one reason or another. The Inboard M1 Premium Electric Skateboard has motors located inside of the wheels and a battery that can be easily changed. LED lights make this board ideal for riding in overcast weather conditions. There are no belts or gears within the body of the motor itself, making annoying (and costly) belt changes irrelevant. One feature of the M1 that stands out is the grip stick of the board. It is extremely strong and very effective in preventing unwanted sliding and foot detachment from the board. If daily commutes to work or normal rides are anticipated from users, the M1 should rank high on the list for boards that will last and travel a sizable distance in between transit with slightly above average battery life. PREMIUM DURABILITY with INDUSTRY-BEST WARRANTY An e-skateboard built with flexible wood core and the same fiberglass found in premium snowboards for a whole new ride. Full 12-month warranty against manufacturing defects. LONGER RANGE WITH SWAPPABLE BATTERY ON THE FLY 7-mile range (depending on riding style) & much further with extra battery you can easily swap in seconds. Easy to carry, this portable electric skateboard is water resistant and approved for air travel. FAST, BUT ALWAYS SAFE Ride up to 22 MPH and make hill climbing easy. The RFLX Remote Control has 3 riding modes to make it safe for any rider, from novice to expert. Plus the only E-board with Integrated LED lights. MANTA DRIVE IN-WHEEL MOTORS FOR A SMOOTH RIDE With no bulky external motors, the M1 has a high-tech look and feel. Smooth acceleration, unsurpassed glide, and smooth deceleration with electronic regenerative braking. CONSTANTLY IMPROVING, THE M1 IS FUTURE PROOF Boost your riding experience. The M1 improves over time with regular firmware updates, all downloaded from the VisionMobile app for the highest performance torque, hill climbing, efficiency, and more. Evolve Skateboards is known in the electric skateboard world for having top-of-the-line performance and durability. The style of this model was designed to replicate the appearance and agility of a Formula One race car. Having built in electronics and an LCD screen on the remote control, the Carbon GT sits low but easily moves under a variety of road conditions, whether on natural ground or smooth pavement. Riders will be able to take this board long distances since the maximum range is 31 miles, one of the highest in all electric skateboards. The Carbon GT also features four distinct speeds that will suit a rider’s experience with operating electric skateboards. Slow Mode allows for easy control and turns, Eco Mode will make the ride relaxing and is suitable for long range travel. Fast and GT modes are useful when making drives up inclines and hills. With all of its stellar features and high acceleration, Evolve Skateboards Carbon GT is one of the best electric boards on the market. RANGE - Up to 12 miles. Varies depending on rider weight, terrain and riding style. HILLS - Up to 25 percent gradient in GT mode. TERRAIN - Any hard or compact surfaces (ie: tarmac, bitumen, concrete, short grass, dirt, uneven and poor terrain surfaces). REMOTE - Magnetic trigger controls for smoothest acceleration and brake feeling. LCD digital screen giving real time riding data such as speed, distance and board diagnostics. Programable Safety/Deadman switch. Four speed modes (GT, FAST, ECO and SLOW). Ergonomic design with a rubber over-mould for ultimate hand comfort. Although the E-Go2 is similar in specifications to the older model, the board design has had some noticeable alterations. The new design is better suited for cruising. Colors come in blue, pink, and green. 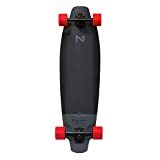 It also boosts a 400-watt motor with a maximum speed of around 12 miles per hour, making it an overall good choice for any skater that seeks a higher than average quality electric board that retails at a respectable price range.